My earliest Star Wars memories are not of the original films, surprisingly enough. 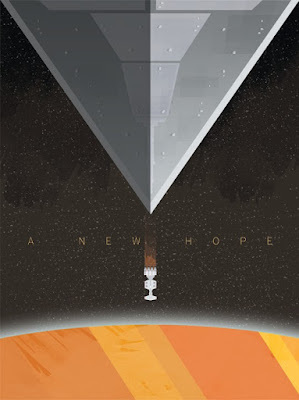 The first time I ever watched A New Hope was in its final terrestrial airing before the special edition re-releases, sometime in the late 1990s. I was 10 or 12, probably a bit older than just about everyone else my year. I was precocious, and considered myself more of a Trekkie than anything else: Star Wars never entered my radar beyond "like Star Trek, but not Star Trek." I didn't really know the characters of Star Wars at that point. Luke Skywalker, Han Solo, Princess Leia, Darth Vader, the Emperor, and other such icons were hazy and vague to me: at least voiceless sprites in platformers, at most legendary beings spoken of in hushed voices, their reputations long preceding them. The only original trilogy characters I had any familiarity with were C3P0 and R2-D2 - thanks to a Saturday morning cartoon. Much like my introduction to Conan, it seems somewhat perverse that this would be my visual introduction to one of the cultural landmarks of 20th Century science fiction. So I came to Star Wars from a completely different place from those who first experienced that galaxy far, far away in cinemas back in 1977: people like my mother and uncle, and Mark Finn, who's written a series of fascinating insights into his personal journey (starting from the beginning). And as a result, my experience of Star Wars Episode VII: The Force Awakens will undoubtedly be different again.